Like sailing? Diving? how about a miniature unmanned submarine that you can use to perform inspections under your boat, explore marine life, find sunken vassals and lost equipment on the sea floor and even help your fishing? Aquabotix claim its $3000 HydroView robot can do all of that and more. There are plenty of small tasks that don’t necessarily require putting a diver into the water. 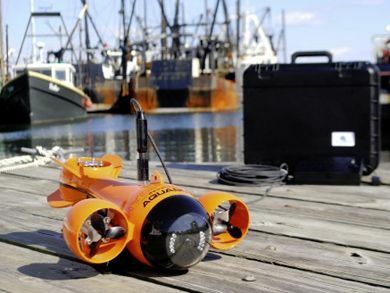 For at least some of them, New England’s Aquabotix new robotic mini sub might be the answer. This tiny contraption includes a 1080p video camera as well as LED lighting for use whenever lighting becomes dim. The HydroView is controlled by an iPad (or iPhone) application via WIFI although the HydroView itself isn’t wireless but is actually connected to a unit which stays above water using a 75 foot (extendable) cable. The HydroView isn’t exactly what you would call fast – its top speed is about 5 knots (just under 6 miles per hour) moving forward and about third of that while moving backwards. The price is also not what you would call cheap at under $4000 but the unit can dive up to 150 feet (given the right cable) and giving its 9 pound weight and small size its defiantly portable. In the future Aquabotix is planning to develop a version with a special claw which will allow the HydroView to operate or catch small objects underwater – making the robotic sub even more useful. In the meantime if you can’t afford the HydroView price tag Aquabotix is also offering the much cheaper AquaLens – a special underwater camera connected to an arm which can help you perform some of the same functions the HydroView is capable of for just $475. More on the HydroView and the AquaLens can be found on the Aquabotix website. TFOT already covered many underwater robots including the recent underwater surveillance robojelly, GhostSwimmer spy vehicle developed for the United States Navy based on the Bluefin tuna, the Airacuda pneumatic robot based on the barracuda, the AirJelly robot designed to fly through the air using the same mechanisms jellyfish use to move through the water and the Robofish developed by researchers at the University of Leeds in the U.K.